Workshops are FREE for MMWD customers $45.00 for all others. Fees benefit the 10,000 Rain Gardens Project. Workshop descriptions and registration below. Come learn how rainwater harvesting can be used to decrease and supplement landscape water requirements, buffer stormwater impacts, and provide an emergency water supply. 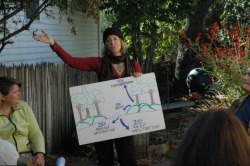 This participatory workshop includes discussion of rainwater harvesting components, design, and technology options as well as hands-on site assessment activities and the installation of a small system with a tank and rain garden. Participants will leave with practical experience and resources to assess site-specific rainwater harvesting opportunities and design, install, and maintain a multi-functional rainwater harvesting system. People interested in planning and development issues as well as home owners and avid gardeners are welcome! Many of us know by now that lawns are thirsty for two things we're growing short on: petroleum and water. Not only that, but studies have shown that Americans spend around $40 billion every year to water, fertilize and mow their lawns, or an average of $700 annually per lawn. With outdoor irrigation accounting for between 30-50% of the typical summer water bill, and lawns representing a primary high-water demand landscape feature, transitioning to water-wise plantings has significant water, financial, habitat, aesthetic, and climatic benefits. According to the EPA, millions of pounds of petroleum-based fertilizers and herbicides are used on lawns annually across the US, and 17 million gallons of oil spilled refilling lawnmowers. All of this negatively impacts beneficial organisms in the soil, can result in an imbalance of natural predator species, leaches into groundwater, and runs off in storm events bringing toxic pollutants into our waterways and their delicate ecosystems. In this hands-on workshop, we will transition a lawn into an aesthetically pleasing, low maintenance, positive impact rain garden that welcomes an abundance of water and wildlife. Resources and techniques including sheet mulching and soil building for successful rainwater harvesting will be provided, along with information on roof runoff calculations, mulching and planting of water-wise plants.